Akron Children’s employees Jamie Bass (at right) and Sarah Robbins are honored by a unique gesture from the Chung family, who are shown left to right: Megan Bailey-Chung, 3-year-old Xavier, Capt. Kiet Chung and 5-year-old Liam (held by Sarah). 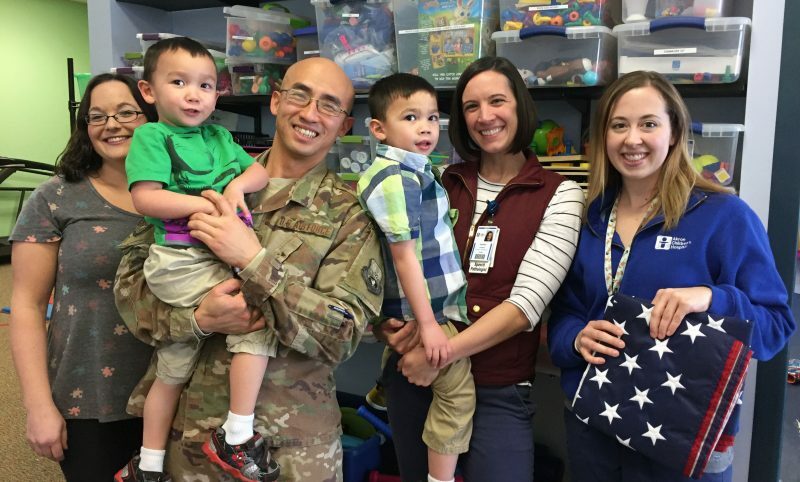 Two Akron Children’s therapists received one of the most heartfelt forms of appreciation of their careers when a father, who had just returned home from deployment overseas, presented them each with American flags which were flown over a combat mission into Iraq and Syria in their honor. Jamie Bass, an occupational therapist, and Sarah Robbins, a speech and language pathologist, have been working with 5-year-old Liam Chung for about 6 months at Akron Children’s North Canton office for Rehabilitative Services. Liam, who has autism, has made great progress working with Jamie and Sarah, said Megan Bailey-Chung, Liam’s mother. Liam’s father, Capt. Kiet Chung, is a deputy base civil engineer with the Ohio Air National Guard. After being deployed since July, he returned home on Jan. 19 and immediately began to attend Liam’s therapy sessions to get caught up and help with interventions they can work on at home. “Sometimes you lose track of the impact that you’re making on your patients and their family’s lives but this was a great reminder of why we do what we do every day,” she said. Capt. Chung says being away from family is the most difficult aspect of military service but knowing all is well back home helps him cope with the days away, as well as the distance.